How and Where to Buy Tricor Online? If you want to fill your prescription for Tricor, you can do it right here on www.CanadianPharmacyWorld.com if you have a signed copy of your prescription ready to upload. You can also speak with someone about your order, simply by dialing 1-866-485-7979. One of our pharmacy technicians would be happy to assist you. You may also visit our FAQ page to see if any of your questions might be answered there. Are there Alternative Names for the Brand and Generic Tricor? Tricor is the brand name medication manufactured by BGP Pharma. It might come from different countries including canada, United Kingdom, and Germany. 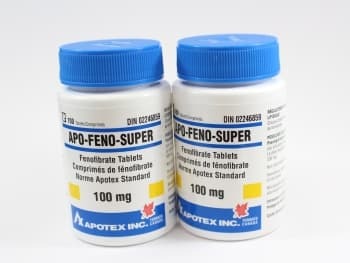 Its generic equivalent is called Fenofibrate comes from Canada (also known as Apo-Feno-Super by Apotex) and India. What Dosages and Forms is Tricor available in? We carry both the brand name medication, Tricor, and its generic equivalent, Fenofibrate, in a variety of dosages include: 48mg, 67mg, 145mg, and 160mg. What is Tricor used for? Tricor is a medicine used to treat high cholesterol and high triglyceride levels (fatty acids in the blood). Having high cholesterol and high triglycerides can increase a person’s risk of developing clogged arteries, which can lead to a host of complications, including death. Tricor works by reducing cholesterol and triglycerides in the blood. What are the Possible Side Effects of Tricor? Most medications will come with side effects. Before deciding if Tricor are right for you, take a closer look at what you might expect. Are there any Precautions and Drug interactions of Tricor? If you take cholestyramine, colesevelam, or colestipol, wait 4-6 hours after taking any of them before taking Tricor. Avoid taking fenofibrate within 1 hour before taking the other medicine, as well. Be sure to talk to your doctor if you are using the above medication, and those you start or stop while on Tricor. Store Tricor at room temperature away from extreme heat, light, and moisture. Avoid drinking alcohol with this medication, as it can raise triglyceride levels, and damage your liver. It’s not currently known whether or not Tricor will harm an unborn or nursing infant. It’s best to avoid this medication if you are pregnant or nursing.